The Forbidden City is a fantastic monument to Beijing, but it is unfortunately very rare for people who have this opportunity, because the Chinese capital is full of treasures to visit, without counting the inevitable excursions to the Great Wall of China which occupies a good time spent there. 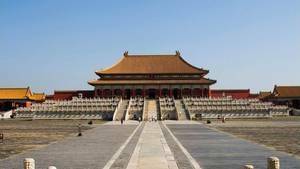 It is a shame because even if only half of the forbidden city is visited, there is so much to see and do not spend a few hours can be frustrating. Nevertheless, even if the visit must be done in a few hours, it is well worth the effort as one is amazed by the architecture of the site, its decorations, and especially its museum pieces. The ideal is to come to metro. The nearest metro stations are Tiananmen East and Tiananmen West. To get to the nearest, take the Nord exit. Each pavilion can be visited freely, thus not only discovering the building, its decoration, its furnishings, but also the collections that may be exhibited there. These may be permanent or temporary exhibitions. The main defect of these collections is their presentations, which leave something to be desired. Learn more about the Museum and its collections. Beijing, the Forbidden City, Tian-an-Men Square, the last Hutongs, shopping streets and the Great Wall ... All this is less than a night in Paris. Beijing can be compared to silk. Kilometers of wild silk thrown all over to stalking stalls. It's cashmere, too. From the noble knit that gives scarves or sweaters overpriced. And then jackets too, shirts, trousers, shoe shoe ... It sells dry, silk street. And so, it takes the Chinese capital into an ultra-light, flea market transhipped 10,000 kilometers from any cultural concern. One can express a certain reserve when it comes to the idea of ​​going so far, that of spinning for a few days at the other end of the world and wasting his time in banal shopping. In fact, we are wrong, for a morning spent chinning on prices already ridiculous in no way forbids an afternoon used to pace history, to cross the red walls of the Forbidden City. On the contrary. The cultural then succeeds the playful, contradicting at the same time the arbitrariness of a dialectic "minor travel" / "major journey". Thus, one leafs through the Pekingese heritage to the late Emperor. Or rather it is seen since since the passage of the camera Bertolluci, one has the impression of pacing the scenery of his film. With the bonus of the Empress Dowager Cixi, very present, for funny for two sous, and which haunts the northern part of the complex ... All this is grandiose, démousuré, and even a little frozen. Outside the contemporary story fizzles and bottles up the Tian-an-Men place. She pedals, too. Then pedal with the Chinese and rent a bike for a small fee. The adventure is formidable, it allows to blend into the mass of two wheels and feel the city as close to its base. One ventures into the hutongs, old districts of Beijing more akin to the favelas of Rio than to the historical centers of the European cities. The houses are low, bricks barely cemented, corrugated iron sheet brown with rust, popotes are installed in the alleys and street hairdressers mow open. A world with the Tintin that is tasted stunned in the late afternoon, just before settling around a round table for a lacquered duck dinner. The secret of the success of such a short journey, a few days getaway, lies in the selection. Above all do not try to see everything, and refrain from guilt. All the same, after the Forbidden City and Tian-an-Men Square, a tour of the Great Wall and the Summer Palace is needed. The escapee takes a day's round trip, and grave in the memories an impression as radical as it is definitive: We must return. The wall has been there for a few years, it will wait a little longer.